I still have most of those dictionaries. I hardly ever refer to them—the shelf they occupy doesn’t see a lot of action, simply because I can usually find more current and more relevant references online. Having them around is a professional security blanket. This one is different. For one thing, I bought it in Chicago, at Bookman’s Corner, a used bookstore that I am surprised but happy to discover is still in business. The place is archetypal—narrow aisles with shelves overflowing onto the floor, a musty stink, and a clerk engaged in a Very Important Discussion with a patron. I found this three-volume collection on one of those overflowing piles priced at $7.50. I had only gone in there to browse, hardly expecting to find anything like this. Even though I had no particular use for it, it took me no time to decide to buy it. 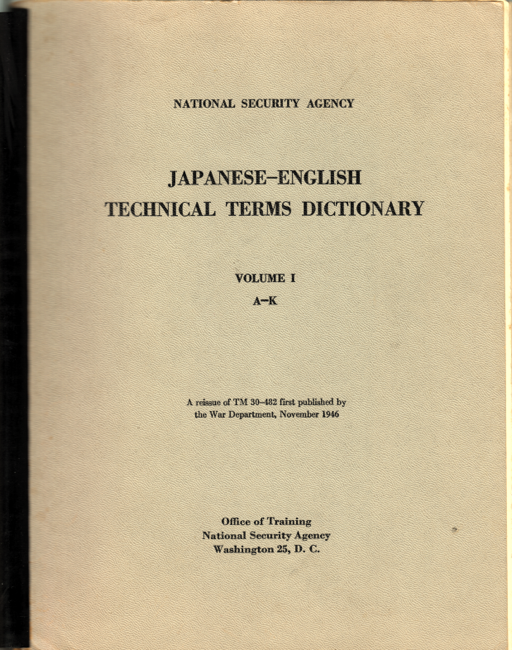 The dictionary itself was published in 1957 by the National Security Agency, “a reissue of TM 30-482 First Published by the War Department, November 1946.” The whole thing was set on a typewriter, with every Japanese headword written by hand, comb bound, and in two volumes of about 500 pages each, plus a 200-page addendum lacking handwritten Japanese. Wow! That’s really neat. Thanks for including the shot of the interior page. 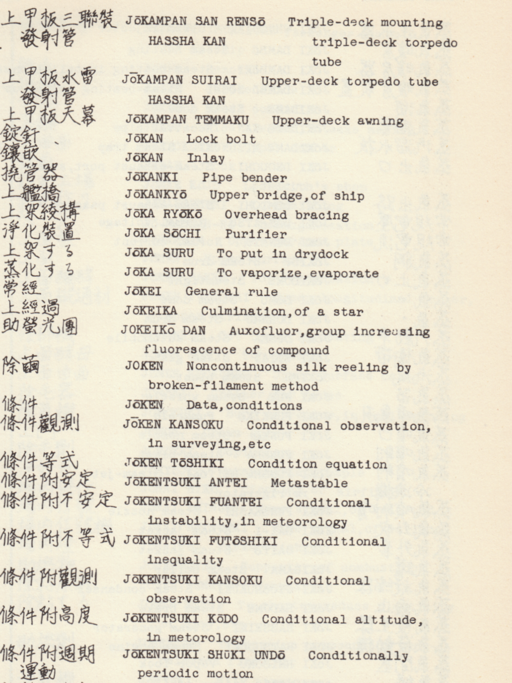 my first japanese class texts (c. 1974) look like this, too. What a fantastic thing to have. I’m jealous. I went to the US military’s Defense Language Institute (DLI) in the late 80s/early 90s. DLI was started in WWII to train Japanese translators/interpreters, and they had a museum with lots of materials similar to that dictionary. Unfortunately, I hadn’t started studying Japanese yet (I was there for Spanish), so I didn’t appreciate them as much as I would today.